UK – Over the past few months Pearce Hire has embraced its CSR (corporate social responsibility) and established a link with a local further education college to provide an internship programme for young people in their locality. Peterborough Regional College runs a BTEC Extended Diploma in Music Technology. It is a two-year full-time vocational course covering all aspects of music technology and is equivalent to studying for three A-Levels. Subjects covered include live sound and production, studio recording, acoustics and audio engineering, and media, marketing and promotional skills. 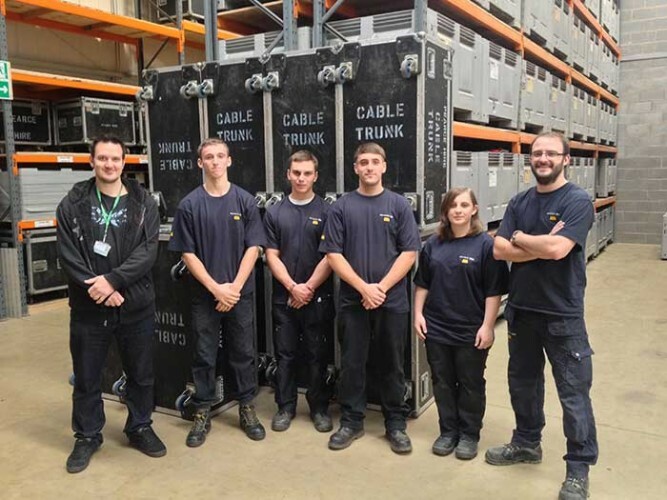 The link established between Pearce Hire and Peterborough Regional College has enabled those students with an interest in the Live Events sector to go into the workplace of this busy production and hire company and learn the ropes in a bona fide work environment. “I’m a keen advocate of supporting the next generation of technicians and production managers in our industry” explains Pearce. “Whilst there are a myriad of vocational courses that students can take in relation to this industry, whatever you learn in a classroom can only really be understood once supported by hands-on experience in the workplace. And what of the students? How do they feel about the opportunity of a six-week internship with Pearce Hire? David Richardson was one of the first in-take of students earlier this year. Not only did he fully embrace the opportunity of working in Pearce Hire’s warehouse to gain practical experience, he was so good at what he did, the company has now offered him a permanent part-time role whilst he completes his B-TEC course. All this with a view to it becoming his first full time job once he graduates in Summer 2014. “It has been a dream placement that looks likely to turn into my dream job!” he enthuses. In picture: Greg Sieling (course leader Peterborough Regional College), Leon Gold, David Richardson, Doug Smith, Jo Ann Lee and Jim Brown (Pearce Hire).